Well it’s taken just over 2 years, 2 years 1 month to be precise, but a red light appeared on the front of my Drobo indicating that one of my hard drives had failed. In case you didn’t know the Drobo is an external storage device that houses a number of SATA hard drives sold by Data Robotics Inc. They promote the Drobo as a fail safe back-up device for your precious data, photographs, music and videos and whatever else you may care to store. You can read my initial report when I acquired this device here if you want to find out more. I really liked the Drobo, especially as you can simply slide out a drive (hot-swap) and replace it with a larger one at any time with supposedly no loss of any data, and not even a screw driver or any fiddly screws are required. What could be simpler? After having several hard drives fail in a relatively short time period back then, I had become particularly paranoid about loosing some my precious data. I’d even had the RAID system on my desktop fail so after a fair bit of research had chosen a Drobo in preference to a RAID or NAS device. I furnished mine with 4 Samsung 1.5TB drives, which until now, had been pretty dam reliable. I’d never had one fail before and had chosen them for their good reputation and reliability. Rather stupidly, I didn’t have any replacement drives on hand, and was kept reminded by the Drobo software (Drobo Dashbord) with a large red dialog box, that my data could no longer be protected until the failed drive was replaced. I rather hurriedly ordered two Seagate Barracuda 2TB drives from Amazon, which now remarkably are only about 60 quid a piece. I awaited their arrival, hoping of course that no further drive failures would occur in between. I wasn’t particularly worried though as after all my primary source of the data was spread across several HD’s within my desktop and the Drobo was, after all, used only for back-up. I did however, make a back-up of some important work and personal files onto some portable HD’s never-the-less. My HD’s arrived from Amazon the next day (thank you Amazon prime!). I was a bit nervous pulling old the old drive but I shouldn’t have been. Once you’ve removed the magnetic front panel from the Drobo all you have to do is push the lever at the left and out it pops the drive then you just slide it out. You don’t even have to power down the Drobo or your PC. It’s just as simple inserting the new drive, although it’s wise to earth yourself by touching some of the metal housing on your desktop PC to discharge any static electricity before handling the new drive. You then just slot the drive in and push it firmly home. I was a little disconcerted at first as the light adjacent to the new drive turned red briefly, but soon afterwards the Drobo goes into it’s initialisation sequence and then presumably then commences spreading the data across from the remaining 3 drives. Whist all this is going on, all four lights blink alternatively amber then green and continue to do so until the drive is ready and the Drobo primed for use once again. This process is exceedingly long however, so be prepared for a very long wait. 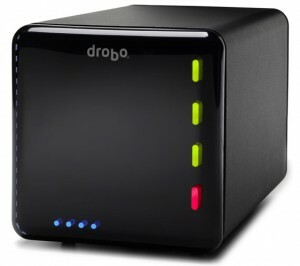 What’s more, whilst this process is on-going, the Drobo is essentially out of action and so is your back up strategy. If you think I’m exaggeration the Drobo dashboard initially came up with an estimated time of several hundred hours, although with time this decreased to more realistic values but these were days rather than weeks, but it took well over 2 days before all the lights on my Drobo turned green. I’m glad to say that despite the exceedingly long time, no ill effects were suffered and all my backed up data was intact. I guess you could say “it did what it said on the tin”, in that the Drobo performed it’s task adequately and precisely when one of my drives failed and no data was lost. I guess what I just wasn’t prepared for was the time it took to get back up and running. Although to be fair, the chances of having another drive fail together with a desktop drive go down at the same time are exceeding small, there is after all that small chance. can I live with that? Absolutely. I now have more faith in the product I bought two years ago and I know it’s draw backs. Next time I’ll keep a spare hard in the cupboard. Drobo products have moved on since my original purchase and they now offer 5-bay models which offer dual-drive failure capabilities, self-healing technologies, and much faster interfaces such as eSATA and USB 3.0. With this enhanced capability comes a significant price hike however. The basic 4-bay model like mine you can still purchase for just over £250, around what I paid 2 years ago, but for the 5-bay models with faster interfaces you are looking at £500-£600 and remember that’s without any of the hard drives. 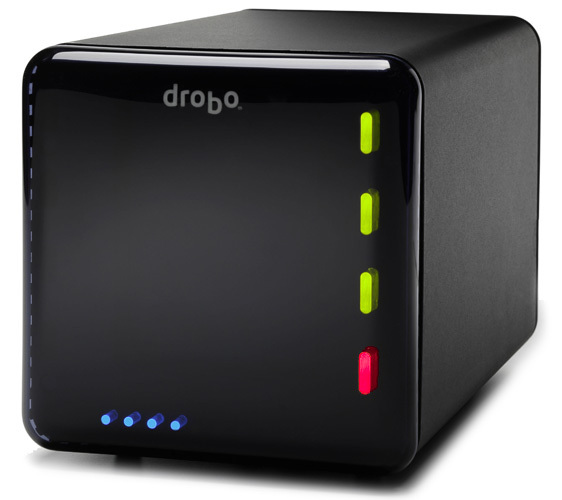 With comparable external RAID and NAS systems going from anywhere from £100-200, the Drobo still looks a tad expensive, although for me it’s ease of use and setting up far outweighs any cost discrepancies on the basic model. The software has moved on quite considerably too in the last two years. Drobo dashboard is now much easier to use, has a simpler and sleek interface and plus you can even set it up to copy files at certain times, although the latter functionality is still fairly basic. I prefer a program called SyncbackSE for that, which allows me to synchronise folders and drives based on a array user criteria, and my data gets backed up (synchronised) on a daily basis without me having to worry about it. Would I still recommend it the Drobo, absolutely yes, for me it’s still the easiest and best option out there.